India is a country with very rich history and much richer heritage. Various art forms are part of the Indian heritage. The Arabic Calligraphy forms an integral part of this heritage. Some art forms were brought and developed in India and some of them were born in India. The early Arabic traders introduced the Arabic Calligraphy art in India around the 7th century. Spirituality was the core purpose of the existence of this art. This art was initiated to preserve the scripts of the Holy Quran. It is a simple yet an artistic illustration of Arabic fonts from the Holy Quran. The Arabic Calligraphy designs were developed during the establishment of the Delhi Sultanate in India. Hence, this art emerged as a mainstream art. Qutubuddin Aibak, who ruled Delhi, decorated and covered Qutub Minar with intricate carvings, designs, and verses of Quran. The Humayun’s tomb in Delhi and the Mughal coins showcase this monumental heritage. The Arabic Calligraphy art form majorly flourished in the Mughals reign. This is also the Mughal art form. Hence, the Muslim rule in India established a diverse culture along with the fresh ink of Arabic Calligraphy styles or designs or paintings to last persistently. The Arabic Calligraphy history is the virtue of the religious and spiritual aspects of life. In conclusion, the calligraphy design is a precious art since the artists practicing this art are rare. These artists are losing their demand and respect in the society. Therefore, Nazariya has joined hands with these artists and has taken a pledge to give them the true value for their talent. Finally, this Eid, admire their work by getting one of their masterpieces home. Get a customized manuscript for yourself by these wonderful artisans and wish your loved ones Eid in the most artistic way. Let us explore more about the Arabic Calligraphy paintings in the Images given below. Tikuli is the local term in Bihar used for Bindi, a colorful dot which married women wear on their forehead between the eyebrows. Bindi is usually worn by Indian women in bright red color. Bindi is used as a symbol of the third eye and hence worn where the sixth chakra is present. However, in present time, Tikuli art is a traditional Indian art and craft form in the Indian history and is used as a source of women empowerment in the Indian state of Bihar. Tikuli painting of Bihar is an art that originates in Patna from more than 800 years. This painting form is in the list of folk art of India. Being avid art lovers, the Mughals provided active patronage and appreciated the features of the tikuli art. The Tikuli art of Bihar is an unprecedented and stand-out piece of hand painting, more than 800 years old and has its source in Patna. It is one of the principle subjects for Nepali and Bhojpuri society tunes. In a large number of the Hindi writing books, it has been used as an image of cheerful married life, a character of a wedded woman. Because of the efforts of two passionate artists, Tikuli Art reemerged on the scene. Chitracharya Padmashree Upendra Marathi was a popular artist in 1954 who worked towards the revival of the dying tikuli art. He got inspiration from Japanese paintings and methods to portray the Tikuli art on hardboard. However, his efforts didn’t gain much popularity till he passed away. It was popular painter and artist Ashok Kumar Biswas who stepped in 1975 after him to take the art to a whole new level. Along with wife Shibani Biswas, Ashok worked hard to develop the art into a source of our livelihood. Eventually, because of his efforts the art gained so much popularity that in Asian Games of the year 1982, Tikuli art pieces were gifted to the best players by Smt. Indira Gandhi, then Prime Minister of India. How to make Tikuli art? Smt. Indira Gandhi selected Tikuli art plates among other crafts. Expensive: The etching gold foil technique on the glass with natural raw materials made the art production work quite costly at that time. Rare: The special skills required for this art was present only the state of Bihar. Detailed Work: Tikuli artist needs to do the detailing in smallest of a piece of the clothes. The above-mentioned characteristics made Tikuli art a sole privilege offered to royal people. After the entrance of the British Raj over Mughal Empire, the art faced a change. Machine made Bindis took popularity over hand-made ones. Hence, thousands of Tikuli artists became jobless. The Tikuli or “Bindi” which has decorated the forehead of Hindu women has now found another incarnation as an art frame, on account of the artist, painter and specialist Shree Ashok Kumar Biswas. Biswas learned the art from Lal Babu Gupta who spent significant time in the art. His energy for restoring an old art of Bihar proved valuable for art lovers as well as for some poor families. With humble beginnings at Dehri On Sone in Rohtas region of Bihar, this man had an aptitude and an ability to match his fantasies. He may be known as the solitary crusader in the fight for the restoration of the diminishing Tikuli specialty and he has kept the fight going at Patna since 1974 with his wife Shibani. Established in 1956, Upendra Maharathi Shilp Anusandhan Sansthan conducts research and training, product development activities and also tries to safeguard the state’s languishing crafts. The home of India’s some initial paintings, Bihar is tremendously rich in its arts and crafts. UMSAS organizes wide range of public programs, like workshops, seminars, fairs, exhibits, and special events. Patna-based Ashok Kumar Biswas has for all intents and purposes with no help reestablished this art. He has melded the tikuli art with another art type of Bihar, Madhubani, to make embellishing divider plates, napkins, place settings, inside decorations, plate, pen stands and other utility things. The hundreds of years old passing on Tikuli art shows the numerous appearances of our rich Indian culture including the acclaimed Madhubani Paintings of Bihar. An old specialty of the Mughal times, tikuli art is really beautiful in the present times also. It is still the part of tribal adornments worn by the Santhal tribe of Bihar. The art of making tikuli is hinting at restoration — as an art and also a good business recommendation for poor groups of Bihar towns. Tikuli art is an unique art form from Bihar, which has a very rich and deep traditional history. The word ‘tikuli’ is the local term for ‘bindi’, which is usually a bright, colorful dot that women wear between their brows. Since olden times, the bindi was created as a symbolic mean to worship intellect and conserve the modesty of women. However, in today’s time, tikuli art serves as a source of empowerment for the women of Bihar. A red bindi worn by married women signifies good marriage and virtue. It is an important symbol of Indian culture. Tikuli art originated in Patna over 800 years ago. It deals with beautifully designed paintings which are manufactured in the local streets of the city. With flourishing sales, Tikuli artform managed to influence traders from across the country to flock to Patna to buy tikuli art in bulk. The Mughals were active patrons of the art form and appreciated its many salient features. This is a rare specialty of Bihar and no such work is found elsewhere. Since it is very intricate and detailed, it requires a special set of skills. Tikuli art is expensive too, as the value of the art is directly proportional to the refinement of the work. In the picture below, it can be easily seen that even though the figures are small-scaled, the artist has not compromised on the details. The intricate craftsmanship made tikuli art the sole privilege of the royalty. With the decline of the Mughal Empire, and the coming of the British Raj, Tikuli art faced a severe blow. The British introduced industrialization, and so, indigenous goods came to be replaced by cheap machine-made goods. Thousands of Tikuli artists were left jobless as machine-made bindis came into the market, and Tikuli art was lost in the chaos. Revival of this art form can solely be attributed to two artists. In 1954, Chitracharya Padmashree Upendra Marathi, single handedly took the initiative to revive this dying art form. He got the idea to portray Tikuli art on glazed hardboard during his stay in Japan, where traditional motifs on colorful hardboard were being commercially sold. Mr Ashok Kumar Biswas, Tikuli craftsman who almost single handedly revived the dying art form. Artist, craftsman, and painter Shree Ashok Kumar Biswas took Tikuli art to a whole new level. He, along with his wife Shibani Biswas, not only revived the art but also developed it into a source of livelihood. Tikuli art now serves as an economic beneficiary for over 300 women in Bihar. The noble efforts of the Biswas and the workmanship of these women are nationally and internationally acclaimed. In 2012, he was selected to participate in the Bihar Divas Celebrations organized in Delhi and Jaipur. He was also assigned the task of explaining the subtle art of Tikuli to the visitors of the International Fair held in Seoul. Tikuli artists use hardboard to create paintings. The hardboard is cut into various shapes like circular, rectangular, triangular, or square. Four-five coats of enamel are applied thereafter on the cut wooden piece. After every coat the wood is rubbed with sandpaper thus giving it a polished surface. After the final coat of enamel is applied, the design is made with paint. It is also embellished with gold foil and jewels. Tikuli art also uses Madhubani motifs in its paintings. It exemplifies the art and it is always a wonderful feeling to see two exceptionally brilliant art forms together in one frame. Beautiful juxtaposition of Tikuli and Madhubani art. Spring and summer season are the most suitable for making this art as the craft requires dry air at room temperature due to usage of enamel paints. Squirrel or sable hair is used to make the brushes and the size range varies from 0.0-20. Tikuli art as a product is more popular as export, rather than as something of cultural significance. The aim of the products is to showcase Indian culture to the rest of the world. The themes mostly revolve around festivals of Bihar, Indian wedding scenes, and Krishna Leela. Tikuli art sold as a wall hanging. Costers and wall hangings with beautiful Tikuli art on them are hugely popular exports. Everyone remembers playing a game of Ludo or Snakes & Ladders be it on a hot summer day or a cool winter evening. These board games that form such a beloved part of our childhood actually take their origins much far behind in history. One such indoor fun game is Chowka Bhara, a traditional Indian board game. In former princely states like Tripura, Karnataka, Madhya Pradesh, Maharastra, Tamil Nadu , Kerala and Punjab, Chowka Bhara was a favorite past time. The board game uses easily available articles like sea shells, broken bangles and tamarind seeds, broken bangle bits and coins. The players seek cialisfrance24.com to move them across a 5 by 5 square drawn on the board to reach an inner space called “home”. It is played in a squares format on the floor. The board is always kept in the center during the game. Each player has a different starting point and initially keeps all his coins there (marked by X on his side). Each player takes turn to throw all four cowrie shells on the floor and moves one of his coins according to the number as indicated by the shells. Movement of coins is in anti-clockwise direction in outer squares and then in clockwise direction in inner squares as shown by the arrow in the diagram. If a player’s coin lands on a square occupied by opponent’s coin. The opponent’s coin is cut and the player gets an extra turn to play. The cut coin returns to its starting home square and has to go round all over again. The crossed squares (home squares) though, are safe places and no coins present here can be cut. When a coin reaches the square left of its home square, it further moves up into the inner squares in clockwise direction. Each coin finishes its race when it manages to get into the innermost crossed square. The first player to get all his coins into the innermost square wins the game. Whenever a chowka or a bhara (four or eight) is got during a throw of cowrie shells, the player gets a bonus turn to throw the cowries. When a player cuts opponent’s coin, he gets an extra turn to play. During an extra turn, either the same coin or some other coin can be played. This ‘Game of Chance’ finds relevance in mythology Mahabharata. Evidently,in two or four player format this game involves an element of chance by the roll of special dice and an element of strategy . The chowka bhara game can be played as fun activities for employees at work. It is a best cooperative board game for 2 players and ideal for employee engagement as it is an indoor game. It is equal to a cooperative fantasy board games and is also an indoor fun game for employees. Want to try this game now? Check out the ‘ Store’ section to buy Chowka Bhara at Nazariya. The sound of moving water, be it the waves of a sea hitting the shore or the gentle flow of a river, has always enthralled the best of us. To commemorate the essence of life, Nazariya brings you Jalatarangam, a percussion instrument that is tuned not with strings but with water! Jalatarangam is an Indian melodic percussion instrument that involves numerous ceramic or metal bowls filled with different levels of water aligned in unique patterns. When the edges of the bowl are stroked, they produce water waves that produce a sound so melodious that one would never really want it to come to a halt. The emergence of Jalatarangam is found in Vātsyāyana’s Kamasutra as playing on musical glasses filled with water. However today this instrument has tumbled into anonymity despite its historical prominence. Being the most traditional Indian classical music, some scholars think that in the ancient period these were in routine practice around the eastern border of India. The medieval musical treatise of Sangeet Parijaat have accomplished this instrument under Ghan-Vadya i.e. an Idiophpnic instrument in which sound is produced by striking a surface, also called concussion idiophones. The Sangeet Saar (manuscript on classical Indian music & dance) considered one with 22 cups to be complete Jalatarangam and one with 15 cups to be of mediocre status. The cups are of varying sizes were made of either bronze or porcelain. Today only china bowls are preferred by artists, numbering around 16 in normal use. The number of cups depends on the melody being played, in order to play this instrument the cups are arranged in a half circle in front of the player who can reach them all easily. Water is poured into the cups and pitch is changed by adjusting the volume of water in the cup. The player then softly hits the cups with a wooden stick on the border to get the sound. However playing this instrument is not at all easy, it requires a lot of skill to produce music leading to trance. Sangeet Saar also mentions that if the player can rotate the water through a quick touch of the stick, nuances and finer variations of the note can be achieved. Poets of the Krishna cult have mentioned the wonders of Jalatarangam in their literature work. Many contemporary players of Carnatic music do attempt to produce Gamak (can be defined as a fast meend or spanning 2-3 notes normally delivered with deliberate force and vigour and repeated in an oscillatory manner) often in the face off sounds going skewed lacking required control. George Harrison played the Jalatarangam on the title track of his 1982 album Gone Troppo. In India, Seethalakshmi Doraiswamy, Shashikala Dani and Nemani Somayajulu are accomplished Jaltarang players. Also one of the major Jalatarangam pro is artist Kottayam TS Ajith Kumar hailing from Kerala. His appealing passion towards this instrument led to his creativity of incorporating both melody and laya (the tempo or speed of a piece), thus opening to a new style of playing the instrument. Today he performs in concerts worldwide and promoting the music Jalatarangam which has fallen into concealment today with the emergence of the extensive variety of music. As being one of a unique type of music and the most soothing one as well, Jalatarangam should be highlighted and promoted so that it can take a comeback from its obscurity and can once again leave its audience with ecstasy. As of how appealing is the idea of water waves with proper techniques when laid together releases sound that is so alluring! Paintings are an exquisite work of an Indian art. Rajasthan is famous for its extremely fine handmade old stamp paper art with embossed bead work. Rajasthan’s role is significant in the expansion of Indian traditional art. One of the most innovative & significant example of Rajasthan’s art treasures is the world of miniature painting includes mainly painting on old stamp papers. A traditional rajasthani stamp paper art is not merely about size, but also about the level of detail in the painting. It’s the detail that differentiates an Old Stamp Paper Painting from others. If you look at it through a magnifying glass, you’ll see extremely fine brush marks with every detail scaled down & finely finished. The painting depicts all the details that bring out a feeling of earthly charm & pleasure. It is indeed an art to cherish & a collector’s delights. There are some important considerations in determining the fundamentals of a stamp paper art. The surface design is not the only basic quality of an artwork. Hence, the terms like appropriation, content, metaphor, mood, narrative, subject, symbol, & theme are used to promote visual & verbal literacy. The spirit of Rajasthan gives an epitome of history & legends. They are colored by courage & romance and find an expression in different paintings. Rajasthan is the land of wonderful legends of romance & bravery. India’s northwest region of the sub-continent is packed with amazing beauty of art, history, & culture that dates back to several centuries. 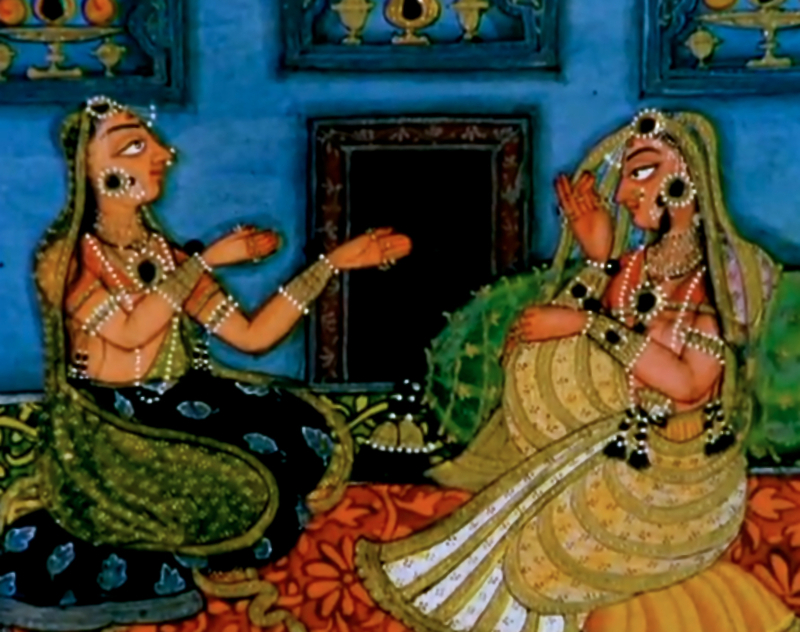 These Rajasthani paintings were founded in Udaipur in 1996. These paintings are placed in the city of lakes called Udaipur. You can see a wide range of high quality paintings from well-known Rajasthan. The Hindu rulers of rajput carried a close political & social links with the Mughal court. They were influenced by the Mughal art paintings. Hence, influenced by the surroundings, paintings have their own unique style. The art includes the paintings of court assemblies, animals like camel and elephants of their army, hills & valleys, religious festivals, processions & scenes. The Radha Krishna paintings depict the life of Lord Krishna a widely devoted Hindu God in India. The traditional stamp paper art painting started falling after the first half of the 18th century. At the end of the century the stamp paper art lost almost most of its strength & attraction. However, in the Pahari region this art maintained its quality till the first quarter of the 19th century. The traditional styles of Indian painting finally perished out in the second half of the 19th century. The art perished due to a conflict of the Western colors & method of painting. The traditional Painting started falling after the first half of the 18th century & by the end of the century it lost almost most of its strength & attraction. However in the Pahari region the art of painting uphold its quality till the end of the first quarter of the 19th century. The traditional styles of Indian painting finally died out in the second half of the 19th century under conflict of the Western colours & method of painting. This article was originally created for, and published on www.gounesco.com, a UNESCO supported umbrella of initiatives that makes heritage fun. In the 1800s, large sheds along both the banks of the of Hooghly River in and around Kolkata and Howrah with rumbling sounds of heavy machines mixing with the soft mellifluous flow of the river producing yarns from raw jute was a common sight. A steady workforce was employed to work on separating, sorting and preparing jute yarns in various jute factories and mills supporting a bustling population of the city and dealing with extensively cultivated ‘pat’ plant in Bengal, from where raw jute would be extracted. 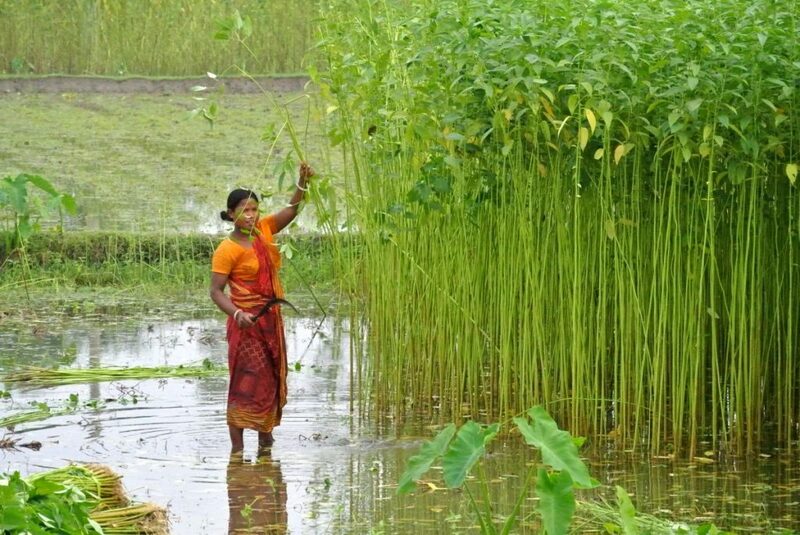 After cotton, jute was the next cheap fabric material readily produced exclusively in the Indian sub-continent and was on the verge of an industrial revolution as the country catered to export demands mainly for the purpose of making sacks and cordage. But the same mills now stand in deafening silence. Wrong decisions taken decades ago actually crumbled the foundation of this once-strong and promising industry. The then communist government refused to supply sacks to nations that were engaged in World Wars, citing wars as imperialistic. Thus, a golden opportunity was lost. Entrepreneurs state that the situation was made worse by the growing demands and various trade unions with wrong expectations. The murder of the CEO of Northbrook Jute Mill H K Maheshwari in Hooghly in 2014 put thousands of permanent and temporary workers out of a livelihood. The insecurity among the owners and entrepreneurs is apparent. Other than assurance, little has been provided to the enthusiasts by the governments, and attempts to resuscitate this industry have so far remained dormant. Fortunately now, a handful of non-governmental organisations have taken the onus upon themselves to find new avenues to generate livelihoods for different sections of the society, and to exhibit what all can be done with the fiber. One such group is Freeset bags that works with impoverished women from the red light areas for a new way to support themselves and their families. 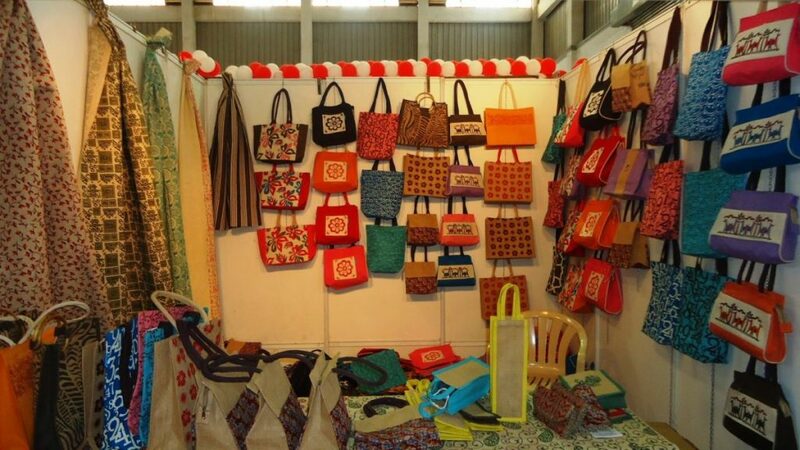 They have experimented with carry bags that are chic-looking and stylish, as this fabric can be dyed, bent and styled as per a designer’s wish. There are some other boutiques that have derived the art of making handloom material for sarees, table cloths, curtains and carpets or upholstery giving them a distinct look. Just the way plastic had replaced jute, now with more awareness regarding the preservation of environment, a slow reverse phenomena is being observed since jute is a highly bio-degradable and eco-friendly material. With the smaller groups showing interest, the government is gradually in the process of realizing the importance of reviving this industry. 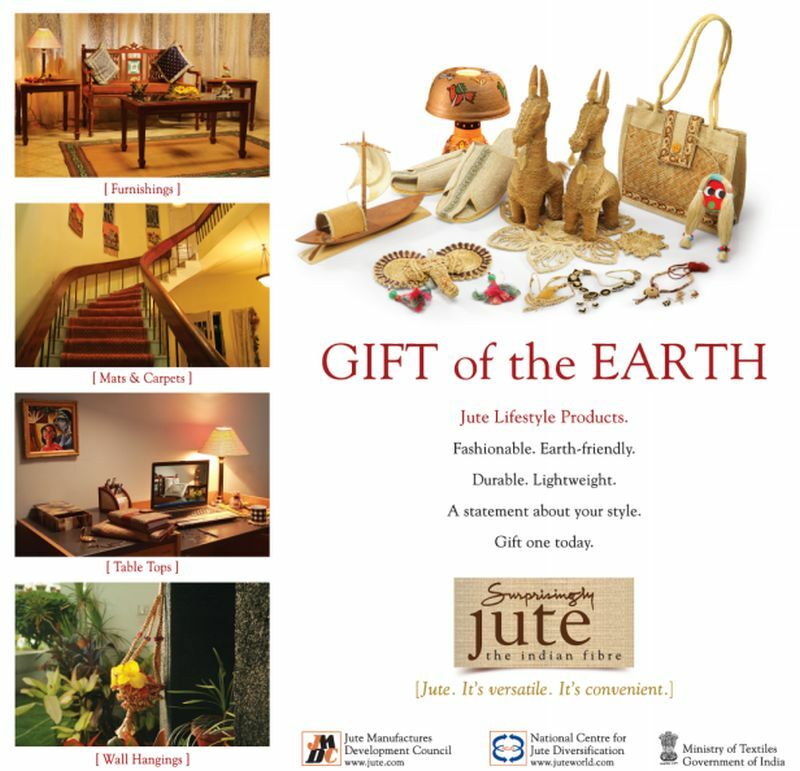 The National Jute Policy was launched in 2005 after the Government of India realized the importance of the fiber. 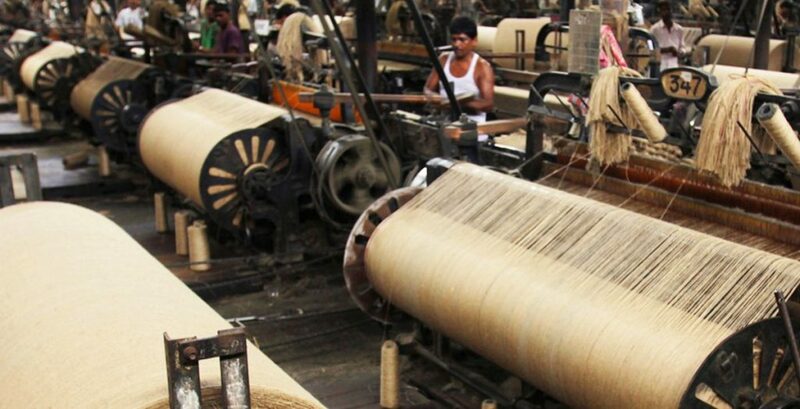 Bengal is the primary producer of the fabric; whereas states such as Andhra Pradesh, Odisha, Tripura, Assam, Uttar Pradesh and Chhattisgarh have mill facilities for the production across the country. With the revival of industry, not only shall we pave ways to provide employment to our youth at different levels but also make ways for a cleaner and greener way of living allowing the nurturing of art in the form of handicrafts as well as utilitarian items.